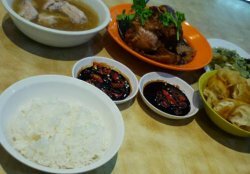 I ordered bak kut teh with normal ribs ($6), you tiao ($1.50), pig trotters ($6) and preserved vegetables ($3). 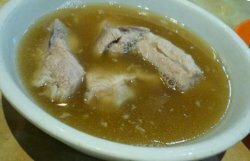 The ribs was soft, tender and the meat easily detached from the bones.The soup was clear and peppery taste with strong flavour of pork broth without the over powering taste of the pepper hence very nice and tasty. Lastly for the pig trotters, the portion is very huge with decent amount of meat, fats and skin and was super tender,super soft,yet it did not have the over cooked feel at all.The sauce blend very nicely with the trotters and taste heavenly! !